On a four-block stretch of road in Harrisburg, Pennsylvania, the bodies just keep piling up. In March, Cynthia Wilson went out to the store and even left her lights and TV on in her apartment, thinking she’d be back quickly, her neighbor told Penn Live. Wilson, 62, was one of four pedestrians and one cyclist killed in the last 20 months trying to cross State Street between 13th and 17th streets in the state capital — a five-lane state-controlled speedway that was recently dubbed the most dangerous street in the nation by the National Association of City Transportation Officials. The death toll along that .68-mile stretch — a fatality rate of 88.64 per 100 million miles traveled — is so staggering that it’s almost four times worse than the former most-dangerous street: New York City’s Queens Boulevard, which earned the nickname of “the Boulevard of Death even though its death rate was only had 24.72 deaths per 100 million. 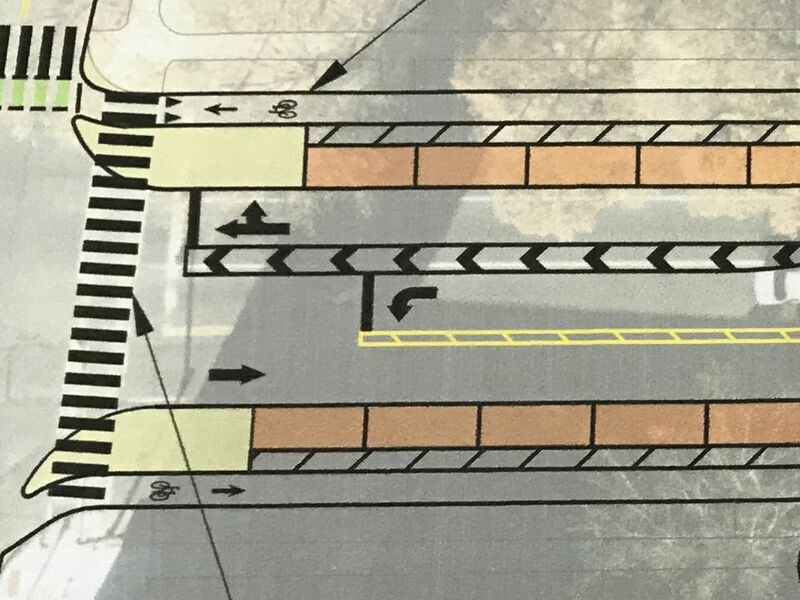 Local officials have taken the matter seriously, proposing to repurpose one lane of car travel in each direction to add a parking-protected bike lane on each side. The design would also reduce the crossing length for pedestrians by about 50 percent. The city also wants to adjust signal timing to give pedestrians a head start on traffic, and reduce the speed limit from 35 miles per hour to 25. “Our focus with present and future infrastructure projects is squarely on pedestrian safety,” Mayor Eric Papenfuse told Penn Live. The city has taken some basic preliminary safety measures by upgrading signals, adding streetlights and trimming trees to improve visibility. But officials are currently waiting on a “go-ahead” from the state for the comprehensive overhaul. It is unclear if Pennsylvania DOT will allow the city to move forward. Indeed, PennDOT has not apologized for all the deaths and seems more concerned about car delays. “We’re committed to working with the city and doing what we can to help make changes that will improve safety on the State Street corridor,” a spokesperson for the agency told the website. “However, we also have concerns about the effect that limiting traffic to a single lane in each direction will have on the safe flow of traffic into and out of the city, especially during the heavily traveled morning and afternoon commutes. Harrisburg officials conducted a survey of attitudes about the street, a major commuter corridor for downtown workers, but one that runs through densely populated neighborhoods where many residents lack cars. A big divide appeared between city dwellers and commuters. The vast majority of pedestrians, bicyclists and local drivers felt unsafe on the road. But 69 percent of commuters said they felt safe. Planners estimate the changes to the road could delay rush hour commuters as much as seven minutes. The city’s data shows commuters are engaging in behavior that puts vulnerable road users at risk. About 60 percent of them were speeding along State Street, according to a city study. There is a wider disparity at work here, too: The people walking and getting killed are a lot poorer than the people hitting them in cars. The median income in Harrisburg is about $32,000 per year. Downtown workers commuting from outside the city typically earn a lot more. “PennDOT has not apologized for all the deaths and seems more concerned about car delays.” Sounds like Maryland where they admit to caring more about automobile throughput than pedestrian and bicycle safety. It is a shame though that people might have to leave for work seven minutes earlier just so a bunch of people in the neighborhood commuters want to speed through can have a safe, livable street. It’s a tradeoff that many (who admit to feeling safe in their giant SUVs) would rather not make. Life is cheap in America. Advance pedestrian walk signals do help. Choking down a 5 lane arterial to a 3 lane one will almost certainly cause massive congestion problems AND likely cause some drivers to divert to roughly parallel side streets that are in no way prepared for the heavier traffic flows of a main arterial. The area-wide safety is likely to be worse. The city COULD also consider overhead or underground pedestrian passageways to cross the street. Just a once beautiful city street widened by people sharing and profiting from your ideology to the point it was right up to people’s doorsteps. Now people are trying to change that and you suggest ‘pedestrian causeways’ instead of undoing the graven mistake made by your generation refusing to surrender outdated and dangerous design. It would be humorous if your efforts didn’t result in such waste in blood and treasure. Where in this densely built neighborhood do you propose they put these over/underpasses, that no one, but motorists who wish to speed through neighborhoods, want? Obviously a collector or arterial. Looks like one of those corridors that was great in the 1920s when streetcars ran down the middle. Lined with nice homes, fine churches, & beaux arts-era schools. Then, those got ripped out, paved over, and now it’s a speedway. Similar corridors are all over the rust belt. Everyone blames industrial decline for struggling neighborhoods but do nothing about the fact that we’ve ruined good neighborhoods with car-commuter infrastructure to the point that the middle class wouldn’t live there even if the jobs came back. Anywhere the city and state authorities deem safety as the real goal. Could you cite any studies indicating that reducing capacity on an arterial results in more deadly collisions on nearby streets (that offset the safety improvements on the arterial)? I see that claim a lot, but haven’t run across anything empirical. Most studies seem to find an overall reduction in congestion (“disappearing traffic”), improved safety, and a boost to commerce. Sounds like TxDOT, too. The most deadly streets in my city are the ones still under jurisdiction of the state, and the city has to fight them every step to make safety improvements. If safety were the real goal, they’d make the changes suggested in the article to reduce crossing distance and add protections for vulnerable road users. And they would disregard the irrelevant opinions of those who put convenience over human lives (and don’t even live in the neighborhood). Looks like individual lane widths might be as much as 11-12 feet, which is well above optimum for safety as well. In other comments you claim to be for safety and acknowledge that streets often have to be redesigned to force motorists to behave appropriately, but whenever the discussion turns to those necessary redesigns you oppose them too. I’m beginning to think you don’t really care about safety at all. I think a lot of states use the same poorly thought out highway manuals (probably to get federal funding) that put cars first to the detriment of people walking and biking. This has made so many neighborhoods and main streets in this country unsafe and unlivable. I recently read that something has changed and local governments will have more control. I wonder, in parts of the world where they design livable streets, like Denmark, and the Netherlands, do the people have to form organizations to fight for them tooth and nail, or do the governments just decide to create balanced, safe, livable streets? It is near impossible to get cities to collect the true data. Safety for the vulnerable users versus flow capacities are a trade off. Engineers must consider both. Do you have any clue what the AADT is to be able to make such strong predictions? It depends on who you talk to. The feds say up to 20,000 ADT is OK for a road diet. Michigan State University did a study for MDOT that said over 10,000 ADT or over 1,000 per hour in peak times made a road diet unacceptable. MSU also said the general federal rules were wrong and needed to be changed. The one where good, full, unedited crash data in Michigan is not available to even the Michigan State Police. The Netherlands became bike friendly because of massive protests in response to children killed by people driving. It wasn’t a top-down decision. 40,000 people die in the US and there’s a collective shrug. If engineers were solely interested in “flow capacity,” arterials would be car-free streets with wide sidewalks and mass transit. Engineers also should not be who gets to decide how much human lives are worth. Thankfully, they are not. “The true data.” The data that no one but you seems to have that supports your paranoid fantasies about “mostly safe” drivers being persecuted, right? In your ideal world where people all lived on high use transit routes, this would work fine. That place does not exist. Arterials in most major cities are often congested at peak hours, because cars are terribly inefficient. Prioritizing mass transit on those routes would have positive effects by almost every metric. People could reach arterials however they do so now, then switch to a more appropriate mode. That model works in plenty of cities to move far more people than automobiles can, and it doesn’t require anyone to live directly on the route. I can’t tell if you’re being deliberately obtuse again. You forget or ignore the reality that if someone can drive door to door in 35 minutes for example, getting them to drive part way and take transit and then walk the last part for a total of 55 to 70+ minutes of travel is a NON-STARTER for many people. Time at home and with family plus the privacy of personal car travel has a HUGE value to many people. You will not get many people to throw away those advantages. Perhaps for young singles with no family obligations the lost time is of little value. For family people, the differences are HUGE. Again, the average speed at rush hour on the arterial near me is 6 mph. It can take an hour or more to cross town. That same trip could be 20 minutes on light rail, with an order of magnitude less risk to life. If we invested half of what goes into subsidizing auto-dependent suburban lifestyles into more efficient modes of transportation, cars would instantly become much less appealing. And people could get home to their families faster. So, by your own admission, the thousand words you spilled to rebut this single post is based on your ‘feelings’ or, better yet, ‘personal observations’! Using a number as a hard barrier to road diets exposes your (and MSU’s, and the feds’) ignorance of how traffic actually works. Free clue (I’m giving you a lot of these lately): TRAFFIC IS NOT A FIXED ENTITY. By design, yes. By use, not even close. Therein the problem you fail to recognize which is a bunch of people are forced to be maimed and die due to you and your cohorts who have developed an allergy to existing outside of a steel box. The 1,000+ per peak hour is likely the most important factor on most collectors & arterials. Are you trying to say high percentages of drivers go for any distance down parallel all-residential 2 lane streets that may have regular stop or yield signs, rather than jog a block or two to take this 5 lane collector or arterial that will flow better with greater safety than the 2 lane streets? I doubt it. I’ve stared at this for seven minutes now and I would love to respond. Can’t figure out what the question is or how the words generally fit together in a way to convey meaning. Another way to ask the question: Are you trying to say this street does not OPERATE as a collector or arterial – that it just looks like one by its design? As with the previous two comments saying exactly the same thing, Jim, ‘yes’. If I lived close to the area, I would go look for myself. I will take your word for it that it does NOT operate as a collector – but comment it would be one of the most unusual exceptions I have ever heard of where such a street does not draw more traffic from the nearby 2 lane streets and thus operate as a collector. 1.Speed causes 1-2% of crashes, so the speeding problem is not an issue. If the speed limits were posted to the 85th percentile, they would be obeyed and all would be safer. 2.How about longer yellow lights in the city, stop signs only where needed, sensors to better control the traffic signals, etc? 3.When do people riding bikes and walking step up and stop doing stupid things that gets them hit? 4.The extra 7m of commute time will add more air pollution. Multiply this out. More crashes maybe too? No need for that. We are commenting on a story about how to keep pedestrian from being maimed and killed. Your suggestion was building ‘pedestrian viaducts’ over the road. The comments in this mini-thread section were about the picture of the 5 lane roadway that LOOKS like a collector/arterial. I said I would take your word for it that it does not actually operate as a collector/arterial – but that would make it a rare exception in my experience for a street with that design. There are many ways to improve pedestrian safety, but choking down major collectors/arterials is not the right way. I think the city has the right to change this immediately, without PennDOT approval; it’s literally a matter of life and death and should be done by emergency order. This isn’t even a state highway. The state has no right to claim jurisdiction over it and the city should demand that it be returned to city control. Mr. Walker, you need to rename your organization the National Murderers Association, since you seem to love to kill people.